From early childhood Maharajji was detached from worldly attachments. 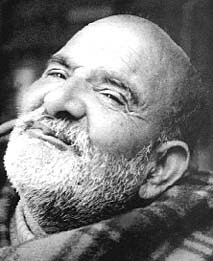 "Maharaj-ji established at least 108 temples, fed millions of people, advised government and corporate leaders, performed what can be called Miracles, influenced current American and Indian society, brought grace into the lives of countless suffering people, and all the while remained out of the public eye." "It's better to see God in everything than to try to figure it out." "Saints did Jap (japa) and Sadhana for 10,000 years..., only then they could succeed in Jap, Meditation and Yoga. But people want to be expert within 5-7 months only." "Cleanse the mirror of your heart, and you will see God." "When you remember me I come to you"
"The best form to worship God is every form." "Attachment is the strongest block to realization." "Whoever works for God, his work will be done by itself. " "The guru must know everything about you." When asked how the heart could be purified, Maharaj-ji said, "Always speak the truth." "You can leave me. I won't leave you. Once I catch hold of you, I don't let go."